Just because an animal is soft and squishy doesn't mean it isn't tough. Experiments at Rice University show the humble hydra is a good example. The hydra doesn't appear to age – and apparently never dies of old age. If you cut one in two, you get hydrae. And each one can eat animals twice its size. These beasties are survivors, and that makes them worthy of study, according to Rice electrical and computer engineer Jacob Robinson. Robinson and his team have developed methods to corral the tiny, squid-like hydrae and perform the first comprehensive characterization of relationships between neural activity and muscle movements in these creatures. Their results appear in the Royal Society of Chemistry journal Lab on a Chip. The researchers used several methods to reveal the basic neural patterns that drive the activities of freshwater hydra vulgaris: They immobilized the animals in narrow, needle-laden passages, dropped them into arenas about one-tenth the size of a dime and let them explore wide-open spaces. They expect their analysis will help them identify patterns that have been conserved by evolution in larger brain architectures. Robinson is a neuroengineer with expertise in microfluidics, the manipulation of fluids and their contents at small scales. His lab has developed an array of chip-based systems that let scientists control movements and even sequester biological systems – cells and small animals – to study them up close and over long periods of time. The lab has studied all of the above with its custom, high-throughput microfluidics systems, with worms representing the "animal" part. But hydrae, which top out at about a half-centimeter long, come in different sizes and change their shapes at will. That presented particular challenges to the engineers. "C. elegans (roundworms) and hydrae have similarities," Robinson said. "They're small and transparent and have relatively few neurons, and that makes it easier to observe the activity of every brain cell at the same time. "But there are enormous biological differences," he said. "The worm has exactly 302 neurons, and we know exactly how it's wired. Hydrae can grow and shrink. They can be cut into pieces and form new animals, so the number of neurons inside can change by factors of 10. 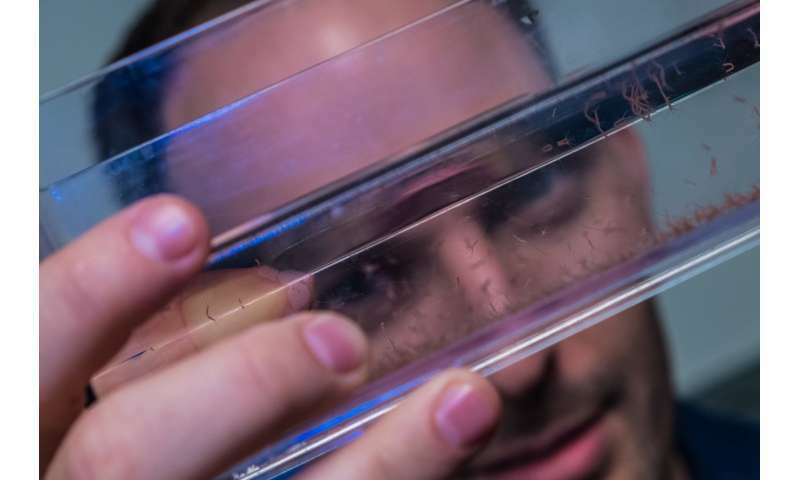 "That means there's a fundamental difference in the animals' neurobiology: Where the worm has to have an exact circuit, the hydrae can have any number of circuits, reorganize in different ways and still perform relatively similar behaviors. That makes them really fun to study." The microfluidics platform let the lab sequester a single hydra for up to 10 hours to study neurological activity during distinct behaviors like body column and tentacle contraction, bending and translocation.Some of the hydrae were wild, while others were modified to express fluorescent or other proteins. 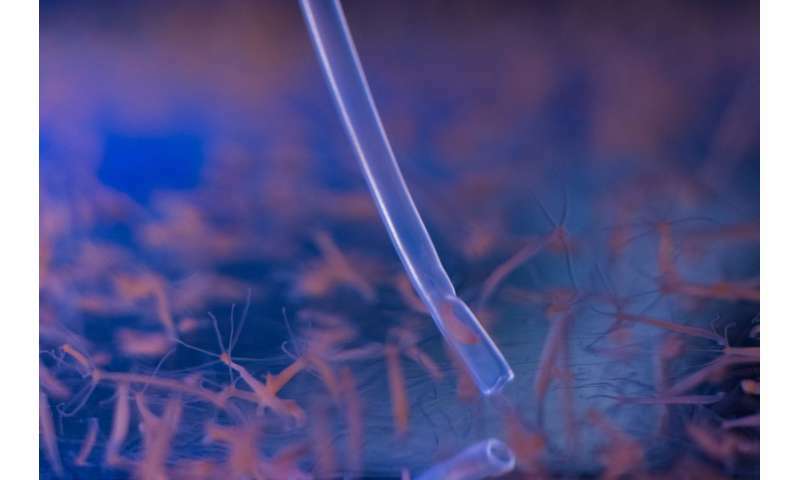 Because the best way to characterize a hydra is to watch it for about a week, the lab is building a camera-laden array of microfluidic chips to produce time-lapse movies of up to 100 animals at once. "If you look at them with the naked eye, they just sit there," Robinson said. "They're kind of boring. But if you speed things up with time-lapse imaging, they're performing all kinds of interesting behaviors. They're sampling their environment; they're moving back and forth." Electrophysiology tests were made possible by the lab's development of Nano-SPEARs, microscopic probes that measure electrical activity in the individual cells of small animals. The needles extend from the center of the hourglass-shaped capture device and penetrate a hydra's cells without doing permanent damage to the animal. Nano-SPEARS don't appear to measure activity of neurons inside the animal, so the researchers used calcium-sensitive proteins to trigger fluorescent signals in the hydra's cells and produced time-lapsed movies in which neurons lit up as they contracted. "We use calcium as a proxy for electrical activity inside the cell," Robinson said. "When a cell becomes active, the electrical potential across its membrane changes. Ion channels open up and allow the calcium to come in." With this approach, the lab could identify the patterns of neural activity that drove muscle contractions. "Calcium imaging gives us spatial resolution, so I know where cells are active," he said. "That's important to understand how the brain of this organism works." Manipulating hydrae is an acquired skill, according to graduate student and lead author Krishna Badhiwala. "If you handle them with pipettes, they're really easy, but they do stick to pretty much anything," she said. "It's a little difficult to jam them into microfluidics because they're really just a two-cell-layer-thick body," Badhiwala said. "You can imagine them being easily shredded. We eventually got to the point where we're really good at inserting them without damaging them too much. It just requires some dexterity and steadiness." With this and future studies, the team hopes to connect neural activity and muscle response to learn about similar connections in other members of the animal kingdom. "C. elegans, drosophila (fruit flies), rats, mice and humans are bilaterians," Robinson said. "We all have bilateral symmetry. That means we shared a common ancestor, hundreds of millions of years ago. Hydrae belong to another group of animals called cnidarians, which are radially symmetric. These are things like jellyfish, and they have a more distant ancestor. "But hydrae and humans shared a common ancestor that we believe was the first animal to have neurons," he said. "From this ancestor came all the nervous systems that we see today. "By looking at organisms in different parts of the phylogenetic tree, we can think about what's common to all animals with nervous systems. Why do we have a nervous system? What is it good for? What are the things that a hydra can do that worms and humans can also do? What are the things they can't do? "These kinds of questions will help us understand how we've evolved the nervous system we have," Robinson said. Co-authors are Rice graduate students Daniel Gonzales and Benjamin Avants and alumnus Daniel Vercosa, now an engineer at Intel Corp. Robinson is an assistant professor of electrical and computer engineering.